The What: ZeeVee has added an MPEG-4- and H.264-encoding media module to its recently announced HDbridge3000. 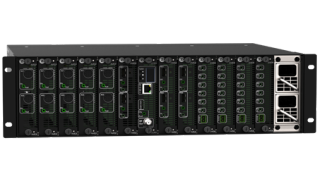 The What Else: HDbridge3000 is ZeeVee’s solution for the AV-over-IP transition, by supporting multi-format IP and RF streaming in a single chassis. At ISE 2017, ZeeVee also launched a new two-channel, H.264 IP media module, which makes the HDbridge3000 capable of transmitting MPEG-2 and MPEG-4 IP streams, and QAM or DVB-T/C RF streams, simultaneously. The HDbridge3000 is capable of distributing HD, SD and soon 4K UHD content over any network to an unlimited number of displays. The Bottom Line: ZeeVee provides solutions to deliver multimedia content across any network—coax, fiber, and Cat-X cable and from any source—HDMI, component, composite, VGA, or HD-SDI. ZeeVee products are engineered specifically to reduce the cost and lengthy process of designing, installing, and expanding a HD to 4K AV over RF or IP distribution systems.